Fighting fires has never looked cooler. Firefighters in Dubai are now equipped with a new and innovative firefighting system designed to help them fight fires from the city’s waterways. 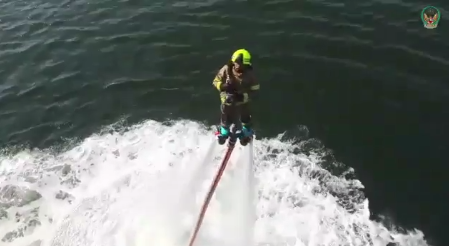 Dubai Civil Defense has released a video demonstrating its new Dolphin system, which is composed of a jet ski, a jetpack, and a fire hose. The jet ski will allow firefighters and first responders to use the river instead of roads to travel to the site of fires, avoiding traffic and shortening their response times. The jetpack will launch the firefighter and the hose into the air so that they can reach bridges, boats, and even buildings along the coast. Because the system operates on water, it includes an unlimited source of water. The fires that continue to strike the sprawling urban centers and towering high rises in Dubai and other city-states in the United Arab Emirates are pushing the country to think of more efficient ways to address firefighting scenarios. For instance, back in 2015, the UAE became the first country to employ jetpack technology for emergency response when Dubai authorities, with the help of the Martin Aircraft Company, began looking into how commercially available jetpacks could be modified to enable firefighters to reach skyscrapers during fires. In addition to the novel firefighting systems already in place, Dubai Civil Defense head Lieutenant Colonel Ali Al Mutawa also mentioned the possibility of building floating fire stations that would allow fires to be tackled from the Dubai Canal. The introduction of the water jetpacks in the Dolphin system marks another innovative first for the UAE, which is consistently embracing cutting-edge technology. The country is currently working to bring Hyperloop One to life, has plans to add artificially intelligent (AI) robot officers to its police force, and is leading the way in digital currency adoption, among many other futuristic endeavors.